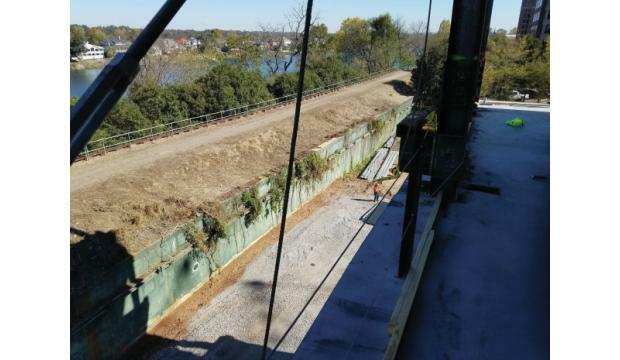 Construction is expected to begin early next year on extending Augusta’s Riverwalk almost a third of a mile to connect with 13th Street. As the Hull McKnight Georgia Cyber Innovation and Training Center takes shape on Reynolds Street, part of the campus plan is to connect the center’s two main buildings with the landscaped brick-and-stone path that has lined the downtown length of the Savannah River since 1987. Riverwalk now extends from Sixth Street to just past 10th Street and the Augusta Riverfront Center. From there to 13th Street, the walkway is about 1,600 feet of unpaved dirt and untended trees and foliage, dubbed New Bartram Trail. But starting in 2018, the trail will be paved; connected to the cyber center by a pair of outdoor patios; and extended to an exit point at the foot of the 13th Street Bridge, according to the Georgia Technology Authority. The GTA is overseeing the cyber center project. The contractor for the center’s construction is working now to select a subcontractor for the Riverwalk extension, Calhoun said. She said $850,000 has been budgeted into the cyber center project for the extension.